How fun is this bracelet?! These beads were called the “Summer” pack, but I think they look more like fall. I love the way these rectangular-ish beads lie against the wrist in a pretty, low profile. 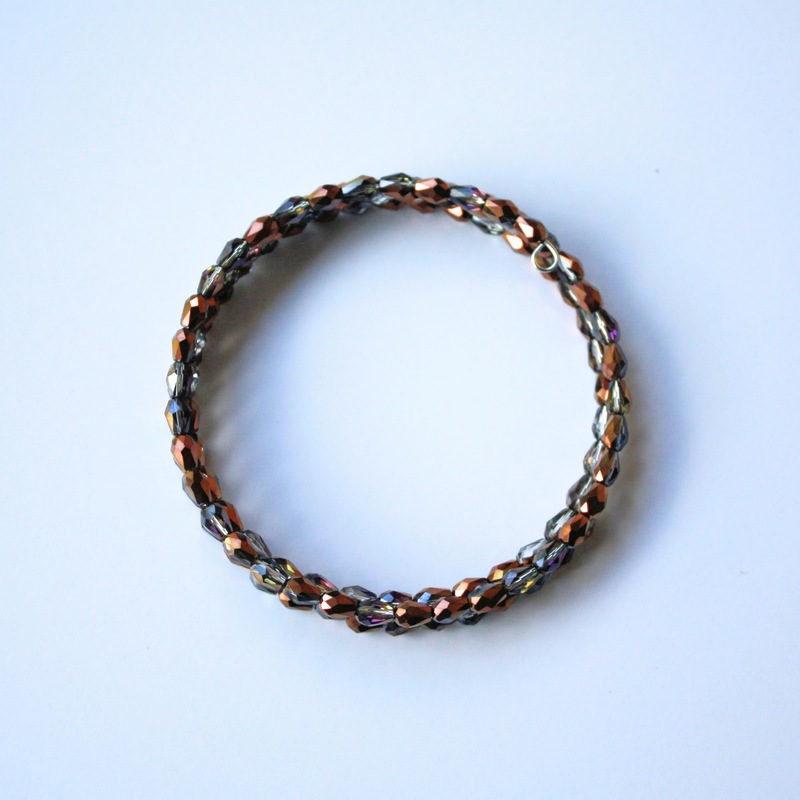 Bright colors combine with a few subtle flashes of metallic finish to give this bracelet a unique look. With so many colors, you can wear this bracelet with anything, although I think the colorful palette makes it lean a bit more casual. I’ve got this piece listed in my Etsy shop if you’d like to take a closer look! Bonus? It’s only FIVE BUCKS! Seriously…I think you need this bracelet. Happy Labor Day weekend! As summer comes to a close, I still like to wear these coral colored seed bead bracelets. They’re just a dark enough color to work really well in this transitional season. I always get a little sad when I put these away for the season, so I’m hoping to get lots of wear out of these before it gets too cold! I think I’ll be able to get a little more wear out of them than usual since I’m now living in the warmer south. 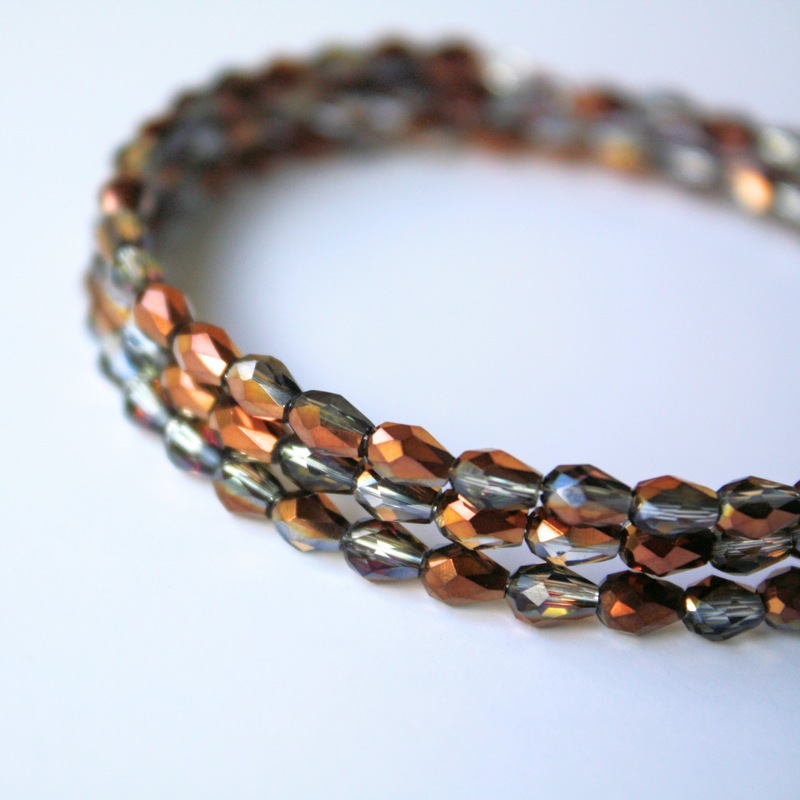 This bracelet made of glass beads on memory wire is a great fall accessory. The warm colors are perfectly cozy yet shiny. 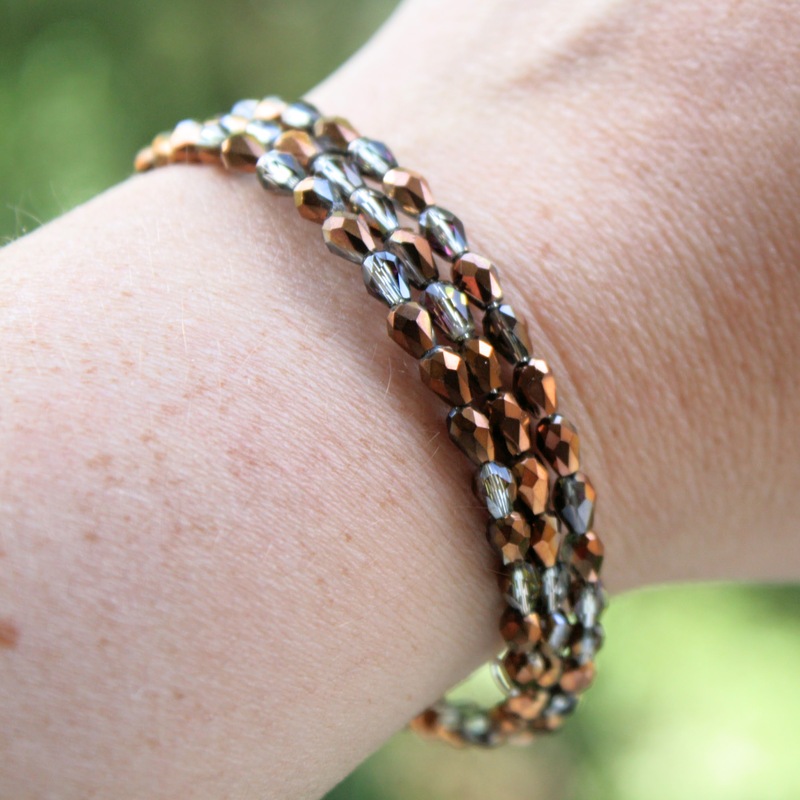 Tones of yellow, orange, green, gold, brown and bronze are randomly placed along the bracelet. I love hiking in the fall to look at the wonderful colors of changing leaves. This bracelet brings that experience and those colors to you! The perfect fall accessory. As a recent transplant to the south, I CANNOT. WAIT. for fall this year. Since I’m not sure I’m going to get many crisp fall days, I’m placing a lot more emphasis on my clothing, jewelry and makeup to get me in the swing of the season. I wanted to carry that over to what I’m creating this time of year, and this was one of the first things to come out of the fall inspiration. These glass beads are neat for a few reasons. First, they’re an interesting shape. Most beads I work with are symmetrical and these are more of a teardrop shape. Second, they’ve got some really neat two-tone coloring. One side of the bead is a subtly metallic bronze color while the other side is a smoky crystal color with a subtle mirrored gold finish over parts of this section. The effect is a little bit of shine and sparkle without TOO much, and the colors remind me of tortoise shell. Memory wire bracelets are great because they’re just so easy. They don’t need to be clasped or adjusted, just put on and go. I’ve really fallen in love with this format because of the ease of wearing them, but also because of the multi-row effect memory wire creates. 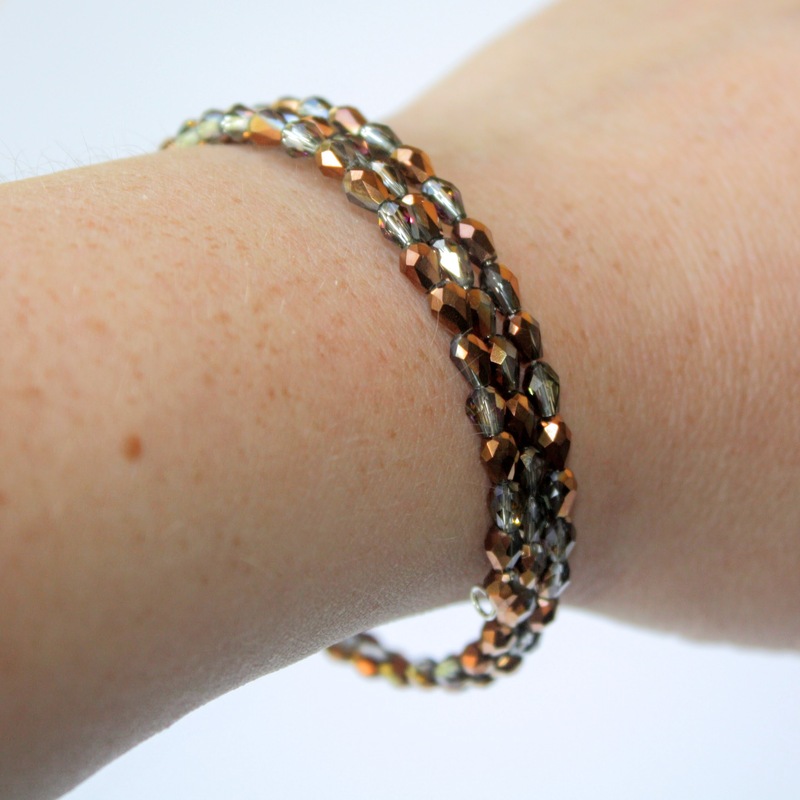 This bracelet is great to wear alone but is also simple enough to wear with other bracelets for an autumn arm party! 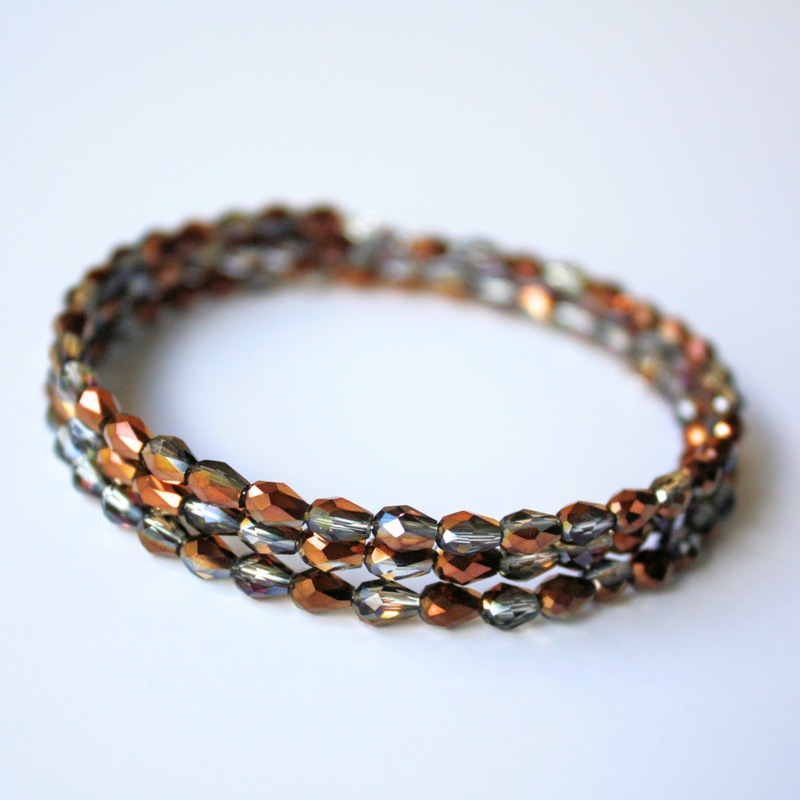 If you’re in the mood for fall, too, you can check out this bracelet here.